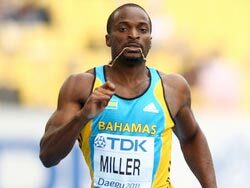 All but Ramon Miller of the English-speaking Caribbean athletes in finals in the track and field competition walked away empty-handed at the Pan American Games, on Wednesday. The Bahamian quarter-miler grabbed a bronze medal in his pet event for the only piece of precious metal for the region at the Telmex Stadium. Miller clocked a season’s best time of 45.01 seconds to finish third, behind Nery Brenes of Costa Rica, whose 44.65 seconds was a personal best (PB), and Luguelin Santos of the Dominican Republic with a PB of 44.71. Chris Brown, another decorated Bahamian quarter-miler, was seventh in a time of 45.89.